Weddings Costs > How Much Does Wedding Bouquet Preservation Cost? How Much Does Wedding Bouquet Preservation Cost? The decision between real and fake flowers for a wedding can be a tough one. Real flowers, while much more beautiful and fragrant, can be much more expensive. Fake flowers can also be kept intact for as long as you would like. However, some people do not realize that real flower arrangements can be preserved as well. Using the freeze-drying technique, your real flower bouquet or centerpiece can be preserved for you. This keepsake can last many years as long as it is kept in its sealed container. Having your bouquet freeze-dried as a way of preservation will cost you anywhere from $150 to $700. This price mostly depends on the size of the arrangement or bouquet, the type of container you have it preserved in, type of matting, type of glass. the process being used and the company you choose. Plan on spending about $6 to $11 per flower, and since the average bouquet has up to 36 flowers, it’s best to budget $215 to $450. If you want a display case, you will have to budget another $100+, depending on the case you want to purchase. Having your bouquet pressed rather than freeze-dried is a much cheaper option, usually costing $75-$250. However, this does not preserve the 3-dimensional effect of the original arrangement the way that freeze-drying does. Frostedfloralmemories.com says you should probably plan on spending about $9 per flower. For example, a service such as HellerAndReid.com offers bouquet preservation services that range anywhere from $160 to $700. Another service, such as KeepsakeFlowerPreservation.com, will do a pressed frame bouquet for $50 to $350 and pressed mats for $17 to $250. Other services, such as sand framed bouquets, can range from $150 to $450. The table below are quote averages we received from local florists that were able to preserve our flowers. The preservation of your arrangement and the container of your choice is included in the quoted price. Common containers can include a heart-shaped frame, shadow box, glass dome or simple rectangular frame. During the process, the flowers will first be placed in a freeze-drying machine and depending on the flowers and company, this process alone can take up to 12 weeks. After the flowers are freeze dried, the flowers will be conditioned and restored to its original “look.” Lastly, the flowers will be color treated and will be installed in the case according to your specifications. A kit containing everything you need to safely and easily ship your arrangement to their facility will be sent to you prior to your wedding day. This will be included if you’re shipping a bouquet. Instructions on the lifetime care of your arrangement will be included. Fabric, ribbon, and other special accents can be added or replaced in your bouquet. The average flower drying and creation process can take up to 12 to 16 weeks. Although the shipping kit will be included, you will most likely have to pay for the postage and shipping of your package. Insurance on the package is also an option that will cost extra. Some companies charge extra if you would like something like an invitation or wedding picture included in your preservation. Other companies will include this for free. Companies can also perform procedures that include pressed frames bouquets, and mats. By using these techniques, the flowers can be preserved into a picture frame. If the flowers are damaged, additional fees can apply to fix it. Engraving names on a mat can cost about $50. Many often engrave their wedding date, along with their names. This preservation uses a silica gel that is a quick-drying, sand-like substance that dries out the flower. The flower will be pressed by a machine. Once the flower has been pressed, the flower will be placed within a frame. Before the flower is freeze-dried, it will be sprayed with a starch-based substance. Once the substance has been applied, the bouquet will be placed in a freeze dryer to bake. 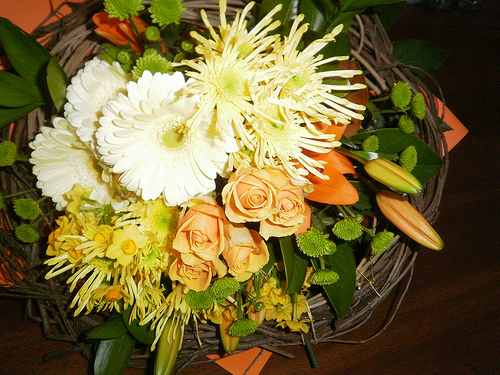 Companies will recommend that the flowers are brought in as soon as possible. After the wedding has ended, the flowers should be brought in immediately. This will ensure that the flowers don’t get beat-up, bruised or get damaged over time. Try to keep the flowers in a Styrofoam cooler if you can’t drop off right away. Place gel backs on the bottom, and cover them with wax paper. Don’t let the bouquet touch them directly as it may cause damage. Plan the preservation plan ahead of time. This way, the flowers can be dropped off right away and they can get started. During the wedding reception, try your best to keep the bouquet out of sight. If you wait longer than seven days, you may have to pay more to have the flowers restored. You don’t need to pick out your design ahead of time. Companies recommend you send in the flowers so they can begin the drying process. This process alone can take up to 16 weeks and allows you plenty of time to make a decision. Almost all flowers are able to be preserved; however, talk with the company ahead of time to see if they have problems with some flowers. Some companies will offer a discount for those who are preserving more than one arrangement. Some will even do a boutonniere for free with the purchase of bouquet preservation. If there is a company in your area that provides preservation services, you can save money by not having to use a shipping kit or pay for shipping. Some companies offer a discount for those who are able to pay in full up front. Consider preserving the flowers on your own. Womangettingmarried.com shows you how you can preserve your own flowers. It is best to select one specific option when shopping for prices. For instance, call multiple companies and ask them about the price for a freeze-dried arrangement in a 5×7 shadowbox and what is included. The more specific you are with what you want, the easier it will be to get an exact quote.